This two-storey house, similar to Gayrileen at 322 Catherine St, is recognizable as Italianate by its narrowness and its vertical lines. The house has a shallow hipped roof. There is a pedimented two storey bay on the left front with a wrap-around second storey balcony on the right. An attractive staircase leads up to an entry porch that wraps around the right side of the house, decorated with brackets and spindles. There is a one-storey box bay on the left side. It has a fieldstone foundation and sits on a narrow city lot on a hillside corner. The house is covered with asbestos siding and was duplexed in 1951. A tender call for a two-storey frame house for Lewis Hall was listed in the VDC 5 Oct 1892. The paper reported the cost to build as $2500 on 3 Jan 1893. 1892-1940: Dr. Lewis Hall (b. Uttoxeter, Staffs, ENG, 1860-1933) and Sophia M. Cummings (b. Hamilton, ON, 1862-1940) married in Victoria in 1889. Lewis’s family came to Ottawa in 1862; they farmed at Russell, ON, then moved to Chemainus, BC, in 1876. Hall tried his hand at farming and lumbering; then in 1886 enrolled in the Philadelphia College of Dental Surgery. He ﬁnished in 1888, practised brieﬂy in Oakville, ON, then established his ofﬁce in Victoria in 1888. His specialty was dental surgery and porcelain work. Sophia was raised on a farm in Wentworth Co, ON. 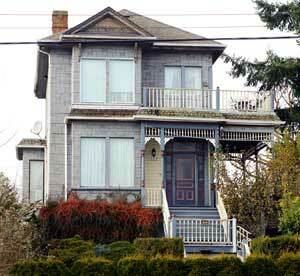 She came to Victoria c.1885 with her widowed mother, Sophie Cummings Lafferty (1838-1913), who lived with the Halls from the time of their marriage until her death. Sophia Hall, an accomplished musician, was the organist for 21 years at First Presbyterian Church. She lived in her Catherine St home until her death. 1941-50: Electrician John Henry Newman (1913-1985) and Jean Haxton (née Smith, b.1915) were born in Victoria and married in 1932. Jean’s parents James, a bricklayer, and Isabella Smith lived at 510 Catherine St from 1932 to the mid-1950s. John Newman worked for BCCSS in the late 1940s.